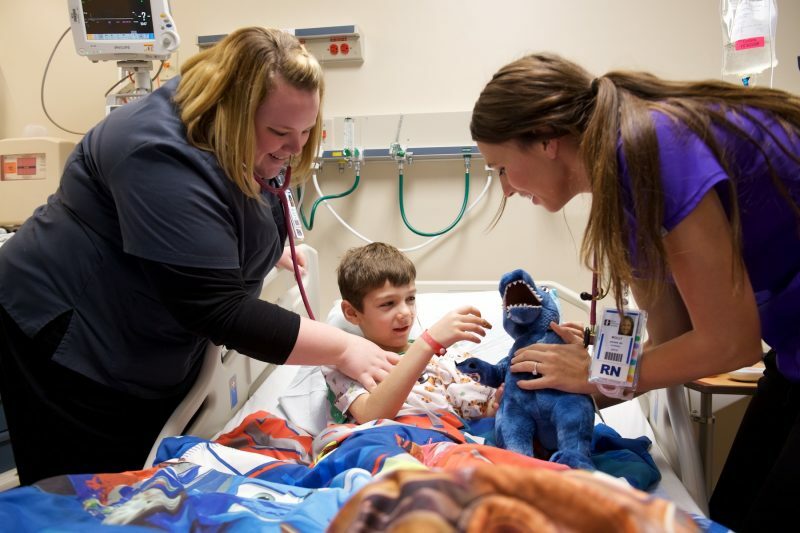 Nurses Sarah Sands and Molly Brown care for 6-year-old Spencer. 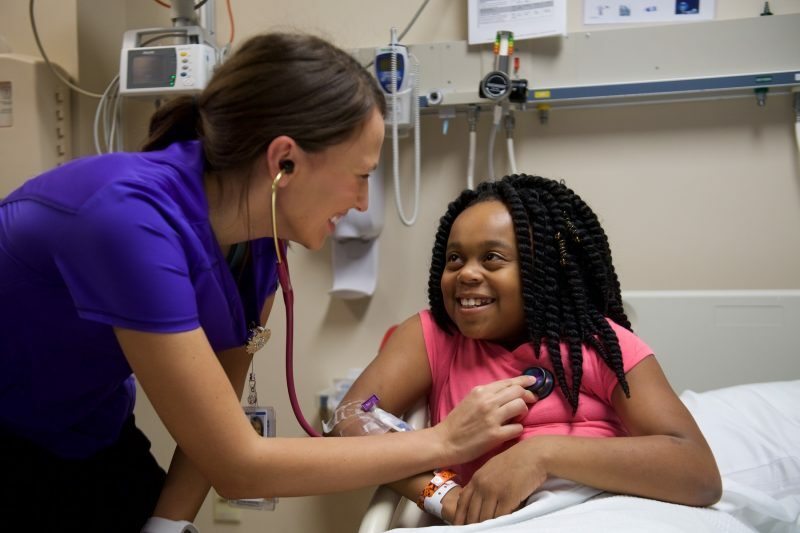 After an extensive evaluation by the American Nurses Credentialing Center (ANCC), Akron Children’s nurse residency program was recently awarded a 3-year accreditation with distinction – the highest recognition given by ANCC’s credentialing program. ANCC accreditation is a voluntary review process intended to strengthen and sustain the quality and integrity of practice transition programs. It provides a powerful, national benchmark for the hospital to continually self-assess and identify ways to strengthen the nurse residency program. 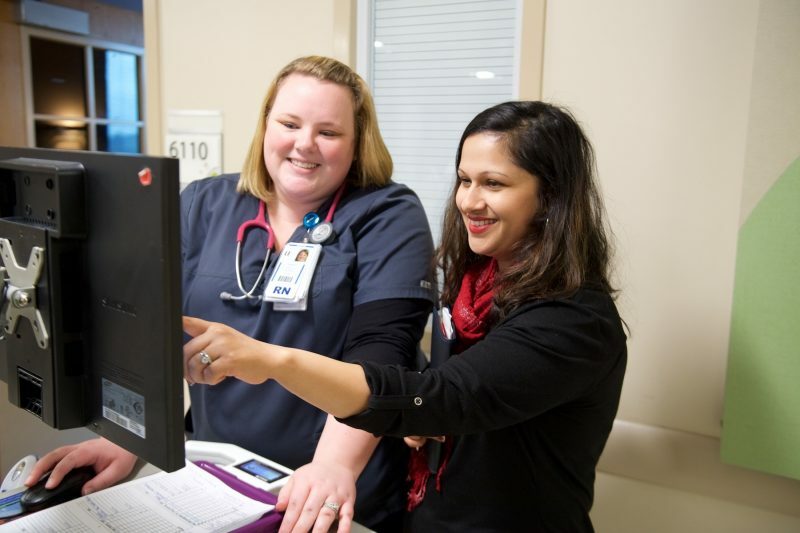 Nurses Meenu Bansal and Sarah Sands enter information into a patient’s medical chart. The nurse residency program was developed in 2015 as a means to help newly graduated nurses enhance their knowledge and skills while acclimating to their roles as practicing professionals. The nurse residency program has graduated 11 cohorts over the past 2 years with 280 nurses participating in the program. As nurses are hired on, they are enrolled into a new cohort. They receive guidance, education, and support for 12 months from program facilitators and preceptors focusing on bedside leadership, critical thinking and reasoning, and patient safety. For float nurse Rachel Michaels, the nurse residency program was a big selling point to joining the Akron Children’s team. Nurse Molly Brown checks on Desirae. Allyson Johnston likes that her cohort is made up of all float nurses, mostly from the night shift. “As floats we face many of the same issues and it’s nice they put us together because we can better relate to each other,” she said. Because this is a first job for these nurses, education sessions focus on transitioning their lives outside of work as well. A recent session focused on practical tips like getting better sleep and eating well. Maggie, who is looking forward to planning a reunion of her early cohorts, hopes to convince some of them to become preceptors in the future.